I must admit to being incredibly impressed with the athletes who compete in this. Captain Caffeine and I started watching the original Japanese Ninja Warrior shows (subtitled) which were highly entertaining. There were more “fun” entrants in costumes who really didn’t expect to get far, but were there for entertainment value, I think. The American version is a bit more serious and there are some really amazing athletes competing. There are some unexpected qualifiers like the youth pastor who just walked on that day and ended up in the top 15 for the Midwest region. The Captain and I like watching because we love seeing people complete the course. I think I also like this show because in the Japanese version and also in the American version, everyone is pulling for everyone. The competition is not as malicious and cutthroat because the course is SO hard. Unlike other reality competitions, the atmosphere seems (so far) to be very positive. I really like that. The negativity is one of the reasons I usually hate reality competition TV shows. My husband and I just started (2 or 3 wks ago) watching this...and we are a little hooked. We sit there and pull for them all (it seems like each one has a reason to be cheered on... whether it's the YP or the man running for his sister-in-law who has cancer, or the one who participated this past week in honor of his brother who is a Marine in Afghanistan). Of course, there are a few who you can tell are kinda arrogant and you're like, whatever, but it's a really cool show and MAN are those guys strong/athletic!!! hehehe, my hubby and i are watching this, too...nothing like ninja warrior to help me unwind after throwing a bridal shower for my sister! speaking of which, i just finished reading weddings & wasabi. such a great ending for the sushi series. thanks for telling jenn's story...i devoured it! Aw thanks so much, Audree!!! I'm so glad you liked it! 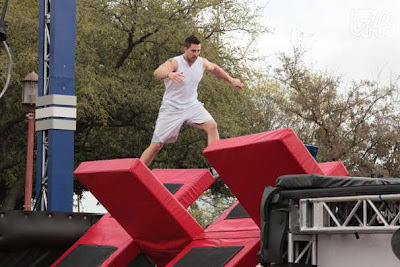 I can totally see how Ninja Warrior would be perfect after a bridal shower! LOLOLOL! We have been watching it. I am enjoying it because it's amazing what you can train your body to do (salmon ladder!). I wish it was on a little earlier, though, because I think my son would like it but he is usually in bed. I like the idea that it is showing that a "warrior" has strength and control rather than what is usually portrayed in movies. Oh, Jeffrey and Tiffany, my boy (and girl) would be in the same boat and miss it too, but I actually discovered the show on my PrimeTime Anytime recordings a few days after the show aired. Now we just watch it when it is convenient, since some nights we’re gone (and when the kids are up). Since all of the four major networks record automatically each night, it is always there (for 8 days a Dish co-worker tells me) and I discover new summer shows all the time. Now that I think about it though, I think we like this show too because it isn’t so cut-throat. Yes, we are never available when it's airing, so we record it with our Tivo so we can watch it anytime later. We love it!